Whenever hotels are available in our stopping towns, we will designate one or more as a "supported hotel". Staying in one of them is the perfect opportunity to sleep in a bed or have more privacy and additional amenities than sleeping indoors or outside before or after a challenging day of riding! Click Here for much more information about our supported hotels. We will post a list of the specific supported hotel(s) in each stopping town online once they have been finalized. If you want to secure your hotel reservations before we announce our supported hotels, MAKE SURE YOU CAN CANCEL IT WITHOUT PENALTY in case the hotel does not end up being a supported one. We will not be responsible for any charges you might incur for any reservations that cannot be cancelled at any hotel. Click Here for the GRABAAWR supported hotels. Click Here for the Bike Northwoods Tour supported hotels. Click Here for the SAGBRAW supported hotels. Click Here for the Will to Ben supported hotels. In order to encourage people to participate who want to stay at hotels and not do not want to camp indoors or outside, we will provide a free hotel baggage delivery service if you stay at one of our supported hotels in each stopping town! 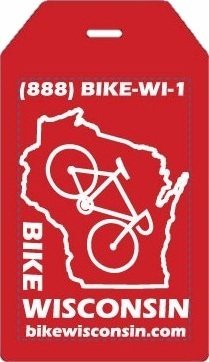 We MUST know which bags go to which supported hotel for every participant in every stopping town so every hotel baggage item must be identified with a separate Bike Wisconsin supported hotel baggage delivery tag (pictured at left) that we will provide for you in your registration materials. In addition, if there are multiple supported hotels in a stopping town you must let us know each specific supported hotel you will be staying at in every stopping town before the event. If you choose to stay at a lodging location other than the main lodging site or a supported hotel, it will be your own responsibility to transport your baggage to this location on your own. Click Here for much more information about our supported hotel baggage delivery service. Click Here for more information about staying at a lodging location other than the main lodging site or supported hotel. The option to sign up for our free hotel baggage delivery service is included on all registration forms. If you have already registered for one of our tours and would like to add on our free supported hotel baggage delivery service you can add it by visiting the following web pages. Click Here to add supported hotel baggage delivery service for GRABAAWR. Click Here to add supported hotel baggage delivery service for the Bike Northwoods Tour. Click Here to add supported hotel baggage delivery service for SAGBRAW. Click Here to add supported hotel baggage delivery service for Will to Ben.